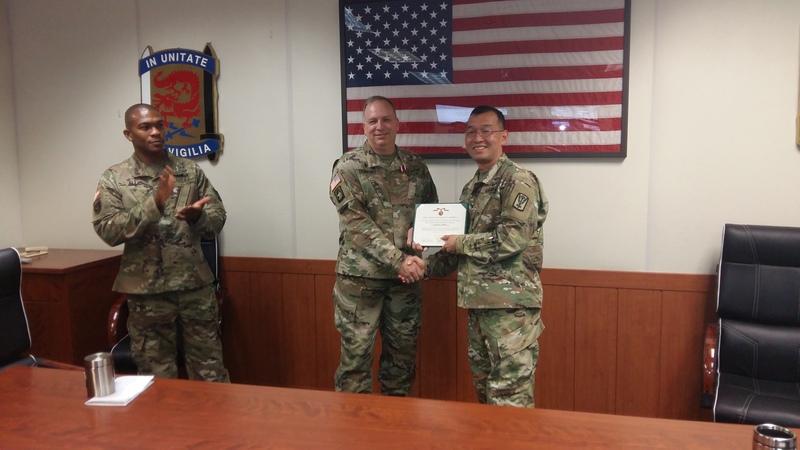 Whenever a Soldier is preparing for a Permanent Change of Station (PCS), in addition to being “farewelled” at the unit Hail and Farewell they usually also receive a PCS award which recognizes their contribution to the unit’s mission during their tenure. Generally, as Soldiers increase in rank, their responsibility also increases so the level of the award increases. Often, the higher awards also demand contribution above what is normally expected as part of their duty as well as contribution beyond the unit itself to the wider military community where the unit is tenant. 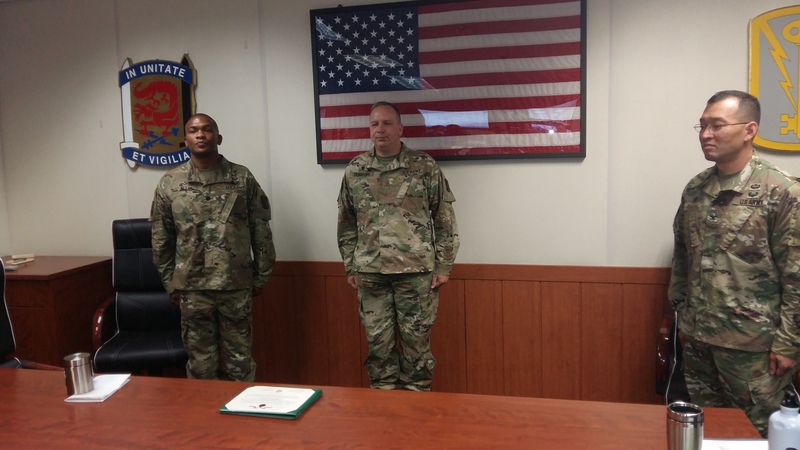 With just about a week left before I PCS, I received my PCS award at today’s Commander’s Stand-up (staff meeting to brief the commander on the week’s activity and focus). It was a good place to receive the award, since it was among the other brigade staff with whom I have worked for the past year. 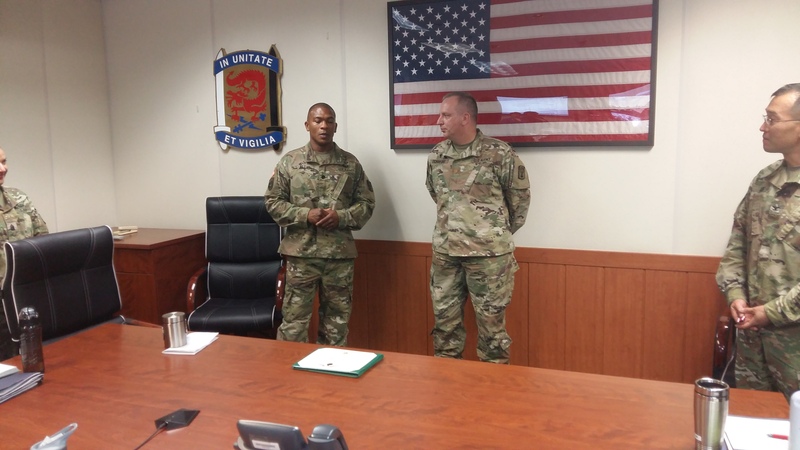 LTC Ali, the BDE Deputy Commander, telling the group about what I was able to accomplish during the year. Standing at attention while the award citation is being read. 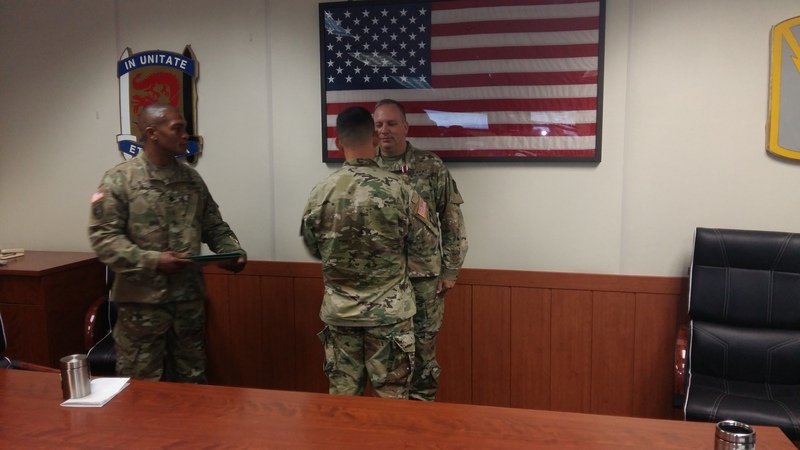 The new BDE Commander, COL Lee, presenting me with my Meritorious Service Medal. The obligatory posed award presentation photo. 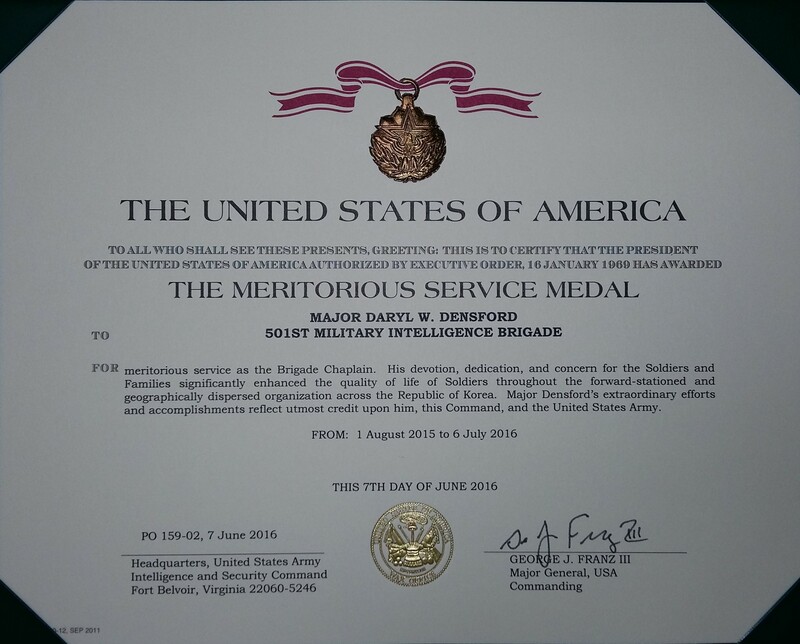 My award certificate (though the date is wrong, I actually signed into the unit 8 July 2016). § 578.18 Meritorious Service Medal. (1) After January 16, 1969, for meritorious service or achievement while serving in a non-combat area. (2) On or after September 11, 2001, for outstanding non-combat meritorious achievement or service in a non-combat or combat area. (b) Description. 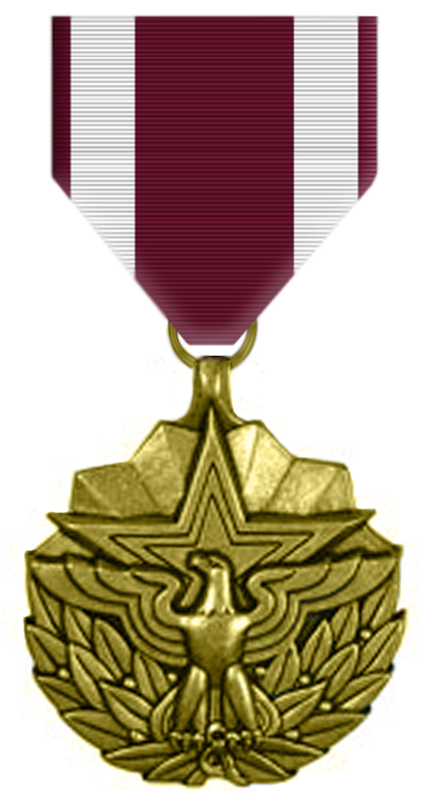 A Bronze medal, 11/2 inches in diameter overall, consisting of six rays issuant from the upper three points of a five-pointed star with beveled edges and containing two smaller stars defined by incised outlines; in front of the lower part of the star an eagle with wings upraised standing upon two upward curving branches of laurel tied with a ribbon between the feet of the eagle. The reverse has the encircled inscriptions “UNITED STATES OF AMERICA” and “MERITORIOUS SERVICE”. The moired ribbon is 13/8 inches wide and consists of the following stripes: 1/8 inch Crimson 67112; 1/4 inch White 67101; center 5/8 inch Crimson;1/4 inch White; and 1/8 inch Crimson.